Every morning, as the first light of dawn is just starting to glow in the sky above Luang Prabang, hundreds of saffron-robed monks depart from their monasteries, walking in a slow procession through the city to collect alms at the morning alms-giving ceremony. Take part in this reverential and beautiful Buddhist ceremony, but be sure to follow the proper behavior in order to show respect to Buddhist tradition and religion, and to get the most meaning out of the experience. It's 5:30 in the morning, and the first glow of dawn hasn't even begun to brush the Laotian sky, but Luang Prabang is already waking up. Monks from the city's dozens of beautiful and historic temples walk silently down the streets of Luang Prabang on the morning tak bat ceremony. 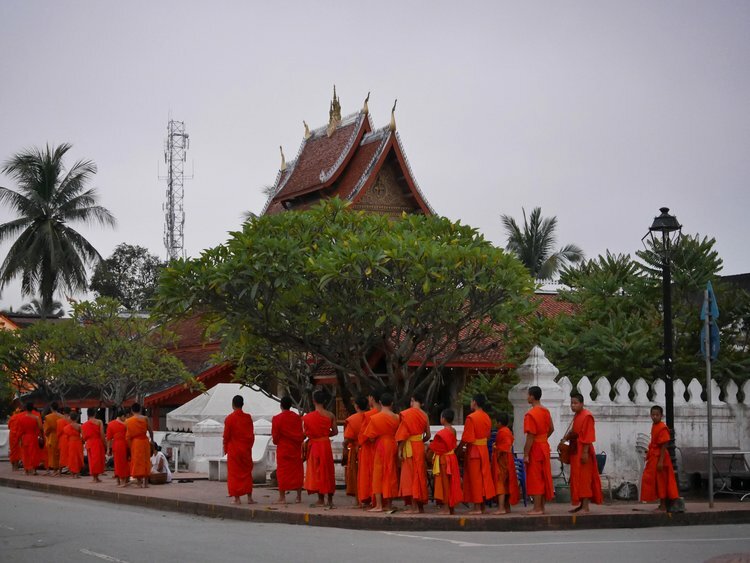 The monks, barefooted and carrying nothing but their simple "beggar's bowls", are on their morning alms rounds, and devout Buddhists are waiting, kneeling in their finest traditional Lao outfits on woven mats along the side of the streets, waiting to offer rice and other foods to the monks. For Buddhists, donating to the monks and supporting the local monasteries is a way of "making merit", or accumulating good karma. The monks, in turn, rely solely on the food that they collect on their alms rounds. It's an ancient ceremony, one that dates back hundreds of years, strengthening the ties between the monks and the laity, and allowing the monks to focus on their ascetic lifestyle. 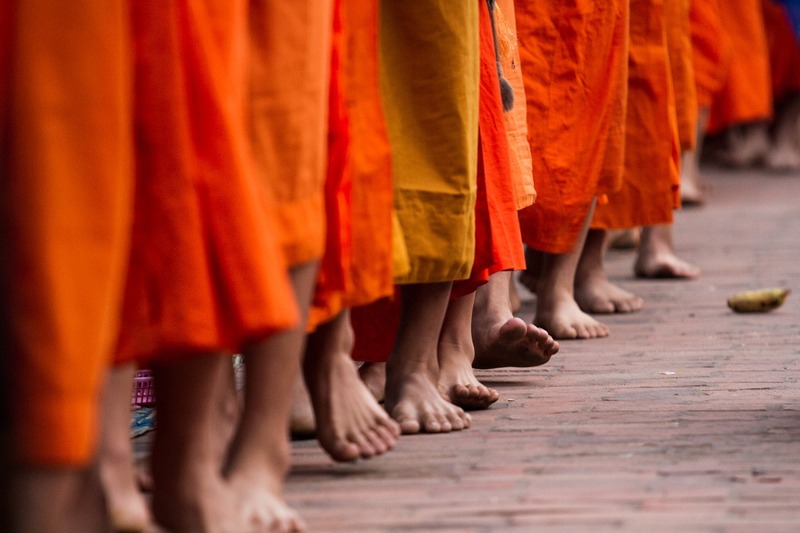 Why do Buddhist monks collect alms? In order to separate themselves from the world, Buddhist monks are forbidden from using money to purchase any food. Instead, monks rely on donations, or alms, given by members of the community in a ceremony called "sai bat" or "tak bat". A monk has just two possessions: his robe and his monk's bowl (or beggar's bowl), which is called a "bat". The act of giving alms to a monk is called "tak bat" or "sai bat". Buddhist monks in Laos eat only one meal a day, a morning meal shared from the food collected on their alms rounds. Monks cannot eat any food after noon, and are sustained entirely by the food received from the morning alms-giving ceremony. The morning alms-giving ceremony takes place every day just before and at sunrise, usually between 5:00 and 5:30 in the morning. If you want to take part in the ceremony, be sure to arrive at least 15 minutes early in order to purchase your donations from one of the vendors on the street - or better yet, from the nearby morning market just next to Wat Mai. You'll be able to see the ceremony in front of any temple in Luang Prabang, but the best place to watch and participate in the morning alms is along Sisavangvong Road, in the areas around the Royal Palace and Haw Phra Bang, Wat Mai, and the Night Market area. Anyone, Buddhist or otherwise, can participate in the morning alms-giving ceremony, but the monks in Luang Prabang ask that you only participate if doing so would be meaningful to you. Too many disrespectful and rude foreign tourists have soured the experience somewhat in recent years, treating the ceremony as a performance rather than the somber religious ceremony that it is. If you want to participate in, or even witness the morning alms-giving ceremony, please follow these regulations for proper behavior in order to give the monks, the local people, and the ancient religious tradition the respect that they deserve. If you want to participate in the alms giving ceremony, arrive early. There ceremony takes place daily between 5:00 and 6:00 am. Don't just join the ceremony for fun. You don’t have to be Buddhist to join the morning alms-giving ceremony, but the monks request that you only participate if it is meaningful for you to do so. If you want to photograph the procession, the monks request that you please stand on the opposite side of the street, at least 3 meters (10 feet) away so as not to distract the participants. Do not speak during the alms giving ceremony as the alms giving ceremony should be conducted in silence.